REF HANB114, REF HAEA1 Steady connection, horse on the bit, the rider’s hand aid, rider’s relaxation, horse’s relaxation, horse balance, engaging the hind legs. The goal of this exercise is to encourage the horse to reach for the contact, whether he is in a low position when stretching the neck down, or in a position with the poll being the highest point. By allowing the horse to round his entire top line, the rider will enable him to optimize his engagement, his pushing power, and his balance. To reach this goal, it is critical for the rider to acquire some freedom of movements especially of his arms and hands. This will allow him to follow the flow of movement of the horse’s neck particularly when the horse lengthens his gait or jumps. Unfortunately, we all know that the natural tendency for riders is to get a good hold of the reins, and to bring the hands toward the belly. Too many horses are blocked in their cervical vertebras and in their back and don’t have this freedom of movement needed in order to use their full potential. 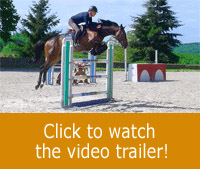 It requires the rider to practise and learn to stay in a vertical position while “giving” his hands to the horse’s mouth. It can be achieved by practising with simple exercises like the one in today’s session. Michel teaches Sélène and Amore. 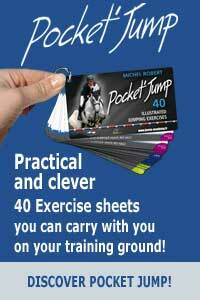 This simple set-up is proven to be good for the rider to acquire good reflexes and generate good responses from the horse. At the beginning of the session, Sélène has to improve her upper body position approaching ground poles. As she practises, her horse starts to loosen up, and becomes easier to direct in a round or on the bit position.